Crafting Faerie Quests are a new kind of quest that involve NC Mall items. In this quest, Delina, the Crafting Faerie, will be asking for your help in retrieving NeoCash items. Once turned in, Delina will award you with exclusive NC item prizes! 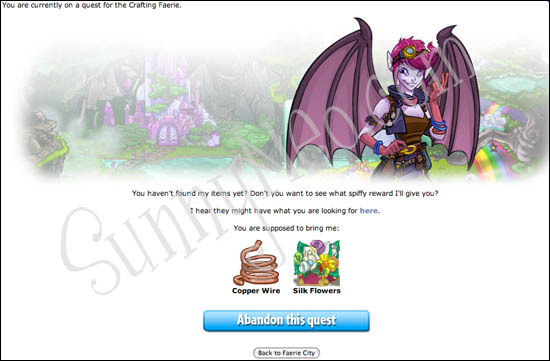 Will you be lucky enough to get a Crafting Faerie Quest? Delina is not your ordinary Dark Faerie. She'd rather be crafting than casting spells, and she loves to collect interesting stuff from the NC Mall for her stash. Who knows when those odds and ends will come in handy? Delina does! She'll happily give you her latest creation if you help her out. 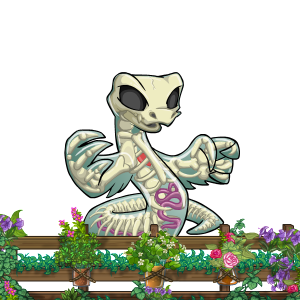 Delina was first introduced on February 7th 2011 during the Faerie Quest event. You can read more about this event on our Faerie Quest Event guide. How do Crafting Faerie Quests work? 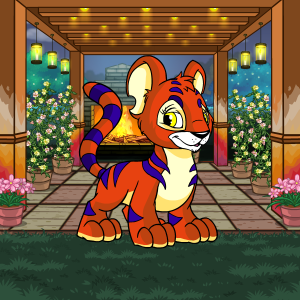 A Crafting Faerie Quest is just like any other Faerie Quest, but instead of asking for neopoint items, Deline will ask you for any two Neocash items. You will need to buy the crafting materials Delina's been asking for from the NC Mall. Keep in mind these are Neocash items. You need to buy them at the NC Mall, which means completing this quest will cost you real money. The items listed below are older Crafting Faerie quest items. Delina isn't asking for them anymore. They will also no longer be listed at the NC Mall, you can however still buy them. In order to get them, use the search bar to look them up. Where can I buy these items? Once you received the Crafting Quest, the Faerie Quests shop at the NC Mall will become available to you. This is a special part of the NC Mall where you can buy the items needed for Deline's quests. You can also find the needed items through the NC Mall's search option. If you search for 'silk', both 'Silk Flowers' and 'Spools of Silk Thread' will show up. For more information, see the FAQ below. 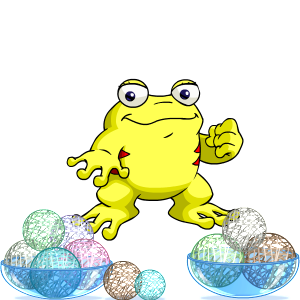 During September 2012 and repeated in 2013 a small event, the bonus Crafting Faerie Quests were launched. Delina is busy in her workshop, getting all the new items ready. If you wanted to do a bonus Crafting Faerie Quests, you could check in to see whether she was there or not. If you actually found her in her workshop, she would give you a bonus quest. You could only get a bonus quest once a day. Besides getting a bonus quest, it is still possible to get a regular Crafting Faerie quest as a random event as well, even if you already completed a bonus quest. What prizes can I receive? It depends on the Quest items she asks. Below you can see the known combinations for each item. Can I do Crafting Faerie Quests on my side accounts? Yes, if you receive an NC Mall Faerie Quest on your side account, you can do the quest on that account. Who is Delina the Crafting Faerie? Delina is a dark faerie, but she's not your ordinary dark faerie. She'd rather be crafting than casting spells, and she loves to collect interesting stuff from the NC Mall for her stash. Who knows when those odds and ends will come in handy? Delina does! She'll happily give you her latest creation if you help her out. How many different quests can Delina give out? At any one time there are multiple quests available. It depends on what kind of items Delina is collecting when you receive a quest. Quest prize items and the crafting items needed to craft those prize items will change every so often, though. How do I get an NC Mall Crafting Faerie Quest? 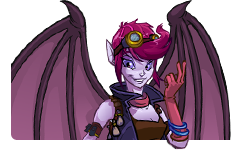 Just like any other faerie quest, you will be asked randomly to help Delina out during your travels around the site. Where do I find the items needed to fulfill the Crafting Faerie Quest? Once you have received a Crafting Faerie Quest, the Crafting Shop will open in the NC Mall. 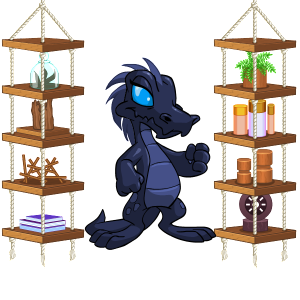 You will be able to purchase the items that are requested by Delina the Crafting Faerie in this shop. Can I gift the wearable items that Delina gives me for completing a quest? Yes. The items that Delina gives you as a reward for completing a quest are just like any other NC item. Why are the crafting items that are requested not wearable? The items that Delina requests are not wearable because they are just the crafting items that she will use to create her prizes. These items can be traded, though.